Buying the best luggage set helps you to travel at will on any occasion. Your options are limitless, from 2 piece carry–on sets for a weekend escape to 5 piece luggage sets for a long holiday. 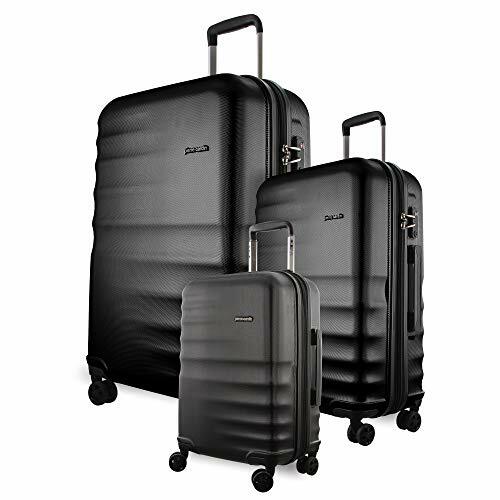 The luggage sets are also available in soft-sided or hard-sided, two wheel or four wheel, and business professional or fashionable patterns. The best luggage sets are generally designed to protect your belongings during travel while keeping everything fashionable. There are numerous luggage set brands out there to choose from depending on your needs and preferences. A high quality luggage set will last longer, endure the inevitable abuse and impact of handling and travelling while keeping your items safe and intact. Click here to see our choice for the Top Luggage Set Now. 1 Why buy a luggage set? You may be wondering if there are any benefits of buying a luggage set instead of buying a separate piece every time you need one. Personally, I find it much more convenient buying a full set of 2 to 4 bags once and not having to worry about running short of packing space. Below are some of the benefits of buying a luggage set, as opposed to buying single pieces separately. A matching luggage set is fashionable and always looks nice. Matching luggage set also helps make it easier to identify your luggage and keep everything organised especially if you are travelling heavy. Having your cosmetic cases and carry-ons matching with your main luggage can save you lots of time at the airport while keeping you fashionable and trendy. The convenience of owning the best luggage sets is that you always have the right bag for each occasion. The carry-on piece can be great for an overnight trip while the next largest piece can come in handy for a weekend gateway. If you are going on a little longer holiday you might need a slightly larger suitcase to carry all you need and still have spare some room for extra items picked up during your travels. Just because you have a 4-piece luggage doesn’t mean you have to carry all the four, you can mix and match depending on the occasion and carrying requirements. Finding the right travel luggage to suit your needs can be difficult. To help you choose, we’ve listed the best luggage sets available for easy comparison along with the main options they provide. To sort the table, click on the column heading. All these Luggage Sets are available in Australia. Luggage sets are an excellent option for families and we have the best family luggage sets available. Frequent travellers are also catered for with a range of different sized of luggage items for all your packing needs. Luggage sets tends to offer a better value and in many cases will cost you significantly lesser compared to buying all the pieces separately. 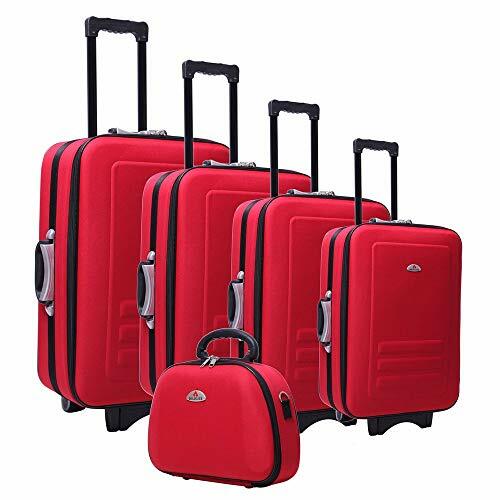 Our selection of good quality luggage sets come in different price ranges, sizes and include many of the best luggage brands in Australia. The most common sets include 3, 4 or 5 pieces, but you can also get 2, 6, 7 or 8 pieces. Most of the sets will include 2 – 3 medium and large suitcases as well lightweight suitcases and some small pieces like the tote bag, duffel bag, make-up case and garment bag. The overall quality and design of the luggage set should also be considered before making the final decision. If your also looking to mix and match with a backpack you may also be interested in our reviews of the Best Travel Backpack. Click Here to see our guide. Luggage sets come in various sizes which may include cosmetic bags and duffel bags. Normally you can neatly place each bag inside another for convenient storage when not in use and have the largest bag holding all the bags. Whether you choose a 2-piece or a 4-piece, you are always assured of plenty of packing and storage space. You can easily pack all the family supplies for a holiday in a colourful set of matching luggage bags. Most luggage sets are normally cheaper compared to buying separate bags with a similar packing capacity. It’s worth considering that Off-brand cheap luggage sets sometimes come with many issues regarding quality. Some of the common issues you can encounter with this sets include. Your bags of choice should be smooth, have sturdy Zippers, high-quality inline wheels, and high-density canvas and ballistic nylons in high-level material. In addition to reliable quality, luggage sets from reputable brands offer warranties on their bags. Good quality luggage sets from name brands usually package their collections in a range of different price points, giving you the opportunity to choose how much to spend on a quality luggage piece. Whether you choose to go with the most luxurious designs or not, you will notice that good quality name brand bags always offer the best due to their policies, warranty, reputation and the quality of features and materials they use to make their lines exceptional. 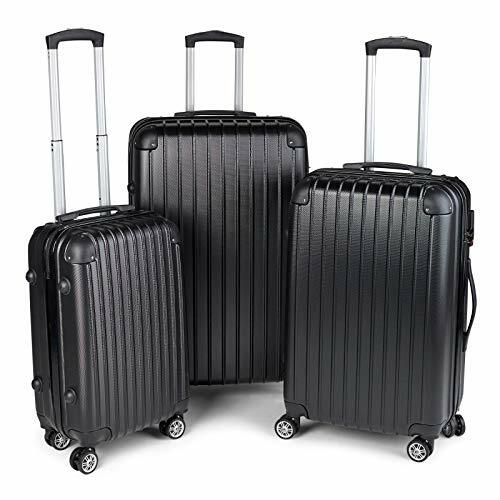 This 3-piece luggage suitcase trolley features a durable hard shell, secured TSA-approve locks and seamless retractable dual wheels. This luggage set is quite easy to maneuver and carry around in train stations, airports and pretty much any transportation hub. The trolley set offers a perfect combination of sturdiness, strength and super lightweight attributes. It consists of 20”, 24” and 28” sizes with corner guard protectors, aluminium pull rod as well as side and top handles for effortless handling and manipulation of each piece. Additionally, the Wanderlite Storage Organiser set makes your packing much easier. The flexible organisers are made of lightweight and water-resistant polyester which comes in 5 different sizes so you can choose what works for you. The clever additional luggage scale allows you to easily and quickly weigh your luggage. Click here for the current price, reviews, and more information. When getting out of town by road, rail or air, it’s critical that your valuables are safe and secure. After all, chances are you’re going to be living out of your suitcase for days or even weeks. The Eaglemate 3pc offers secure, durable luggage to make sure you have a worry-free journey. 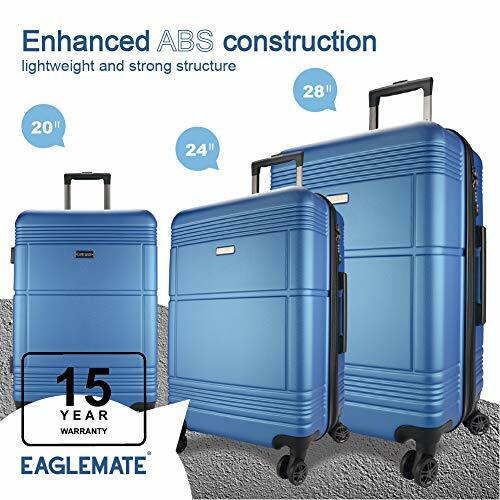 After you pack your high-capacity Eaglemate 3pc suitcase set to the brim, you’ll be thankful it has rolling wheels. Save your back and other joints by choosing a model that has the appropriate wheels and collapsible, pull handles to make your travel more comfortable. 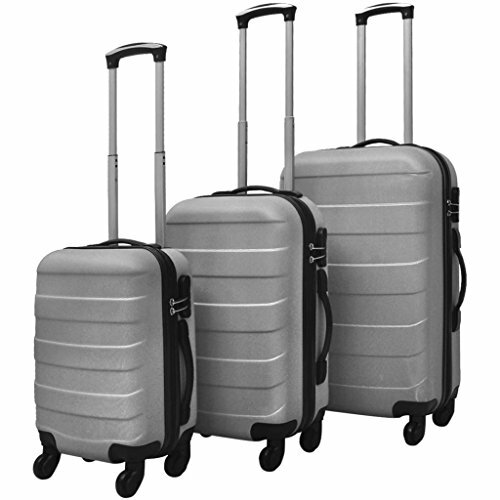 The luggage set has three pieces in sizes of 20 inch, 24 inches, and 28 inches, and can be stored one into another. Made from 100% ABS, Lightweight but impressively durable material. The spinner wheels are multi directional, smooth and silent, while the sturdy ergonomic aluminium telescoping handle makes manoeuvring it all easy. It has an interior mesh helps with the organisation so you can keep your items organised. The 24″+28 sizes are expandable up to 15% to offer extra storage space. Moving around with your suitcases down the street, through the train station or at the airport should not be that much of a chore. With the Wanderlite 2 Pieces, the four wheels do all the heavy lifting as you stroll along. The lightweight, hard shell exterior is made of a tough ABS material with a TSA approved lock system. Four 360 degree spinner wheels allow you to maneuver the suitcase in any direction with ease. The interior has elastic cross straps and a zipped pocket to help you keep your belongings together and organised. The retractable handle is made from a tough aluminium material. The 20” piece easily fits in the 28” piece for ease of storage when not in use. Corner guard protectors and top and side handles add to the effortless handling of each piece. The Milano Slim Line 3 piece Set is an ultimate way of securing your luggage in style. 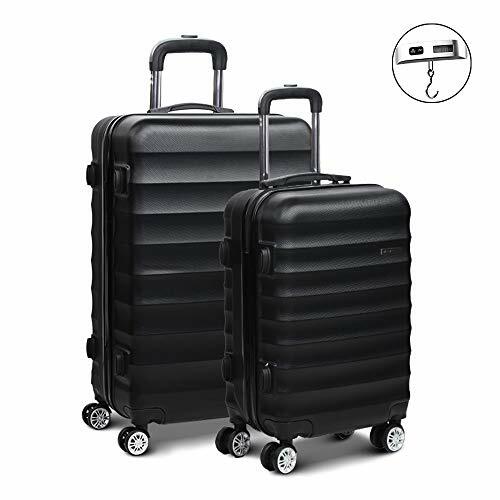 This lightweight, quality and admirable wheeled suitcase set is made from an extremely durable ABS material, each with a fixed combination lock –making sure that your valuables are safe at all times while in transit. The set includes three sized suitcases, 20”, 24” and 28”, each with ample packing capacity, which makes them perfect for long business and holidays. The 360-degree wheels maneuver your cases with ease while the slimline, lightweight exterior gives you more weight allowance for stuffing in those extras. The overall exterior design borrows a contemporary style that will make you stand out in a crowd. Planning to haul a half of your wardrobe to your long holiday? No problem, the BEDDOM 3 Piece Hardcase Trolley Set will ensure that you have all the stuff you need, whether it’s a holiday or business trip. This set too comes with durable, high-quality ABS hard shell material with security locks to secure your valuables. The internal organisation straps help to keep your items in places and organised. Each case is equipped with a telescopic handle and two carrying handles, one on top and one on the sides. The comfortable travel experience is further enhanced by the four 360 degree wheels. The set includes 3 sets in different sizes, all highly durable and lightweight. Yet another impressive package from BEDDOM. This works great when you have even more stuff to take on your trip, whether it’s a business or holiday trip. Like the 3 pieces, this set is made of high quality, durable ABS materials secured by an approved security lock. It also has internal tension straps to ensure your items well organised and kept in place. Each case has one side handle and one top handle, with a telescoping handle that makes moving around with the cases a breeze. Combine that with the 360-degree wheels and you have travel convenience in wheels. From an overseas adventure to family weekend gateways, this 5 piece set promises to accommodate all your travelling needs. The 5 pieces include 4 cases and one bonus beauty case in a range of sizes. There is an added bonus of in-built combination padlocks, this means you can forget about the locks and keys that may get broken, lost or tampered with. All you need a unique code and all is good. Each case has a static top and side handle in addition to the retractable, telescopic handle for ease of moving around. Each piece fits snugly into the next, making them easy to store when not in use. This option is for travellers looking for super light and highly durable suitcase sets. 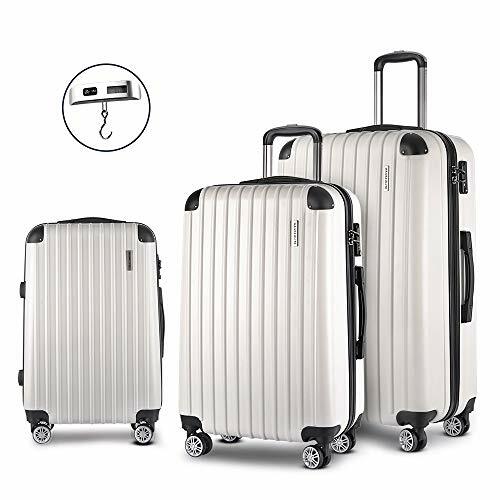 At a quick glance, the largest of the set seems to offer generous storage space -medium and large luggage set features an expandable design for added packing capacity. The inner zip shirt compartments and fully lined interior make organisation an easy task. Rest easy knowing that next time you jet off on an adventure, Pierre Cardin is looking after your valuables, and get back to enjoying picturesque views of unimaginable beauty. Other notable extras include wheels with 360-degree rotation, push-button recessed locking handle, lightweight durable construction and steady grip handle for easy lifting. This 3 Piece Baggage Suitcase is designed with a stylish traveller in mind. One of the design features that set it aside is the deep etched grooves that combine strength and style. The set comes with an expandable option which means you have a little more room for your extras on your next trip. The stylish hard-shell design makes it lightweight with 360-degree spinner wheels that are both functional and durable. The interior of each case is lined with adjustable belts and internal zip pocket to securely hold your packed valuables. Each piece also has a TSA lock for maximum security. The caterpillar 1904 combines modern functionality with classical design to offer an ideal solution for travel or even everyday use. The exterior of these cases a splendid traditional design. It has timeless colours of denim blue, black/grey and sand which blend seamlessly with any traveller’s taste and style. If you’re looking for a new travel luggage, then this will definitely make a good companion. It has a two-wheel system and a telescoping handle that make getting around quite easy. The main compartment is spacious and comes with parallel compression straps that help keep your valuables in place. Luggage sets come in various combinations, from modest 2-piece sets to spacious 5-piece sets. Most 2-piece sets are designed for light travellers and often combine a medium suitcase with a cosmetic case or carry-on bag. This set is best suited for short trips or weekend getaways. The 3-piece sets often come with two wheeled suitcases and a small carry-on or tote to carry with you. If you are a duffel bag fan, you may rather a 3-piece duffel luggage set. Duffel’s are usually expandable and can hold more, but are not the best for carrying dresses or suits. If you are a frequent business traveller, then you can find some professional lightweight luggage made from durable fabrics with external pockets which are great for quick access. Also available are speciality 3-piece sets designed to suit specific functions. If you are a golfer, for instance, you can go for special golfer travel sets that consist of a large bag for the golf set, a small shoe bag, and a duffel bag. You can always strap the duffel bag on top of the larger bag for convenient transportation. If you anticipate lots of long trips with a couple of family members, then you should probably consider a 4-piece or a 5-piece luggage set. These sets often include 2 or 3 wheeled cases and 1 or 2 smaller bags (tote, duffel or personal travel kit). Most 4-piece and 5-piece luggage sets have nested designs which make them easy to store by packing the smaller pieces into the larger ones so that the largest bag holds all of them when not in use. Your choice of the number of cases will generally depend on the nature of your upcoming trips and volume of personal items you intend to be carrying. We have included here what we consider a mix of different sizes, various number of cases and designs to match your unique travelling needs. Luggage sets often come in two main cases. 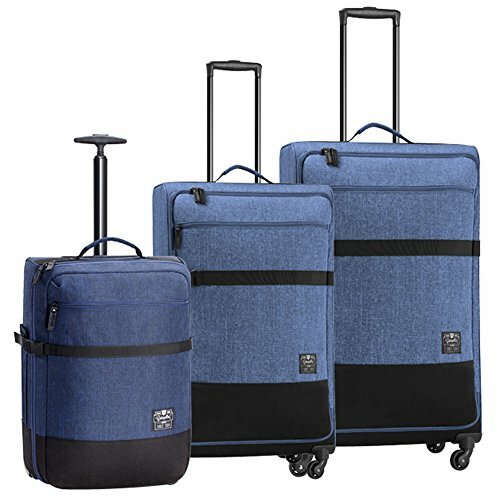 Soft sided luggage and hardside luggage sets. Each of them has its own benefits and downsides. Depending on the type of items you are carrying and your preferences, you may prefer one type of the other. 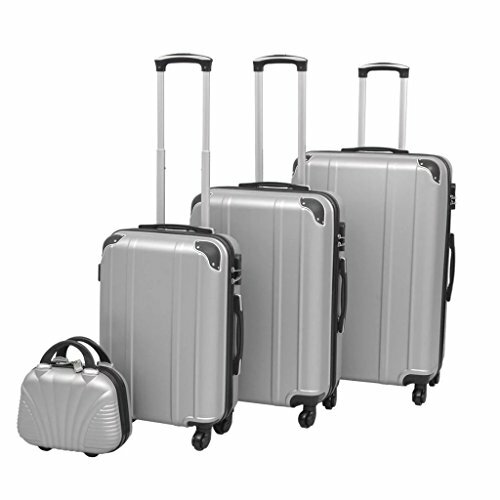 Generally, Soft-sided luggage sets were initially the most popular in the market, but hard-sided sets are quickly gaining popularity. Let’s take a closer look at each of these two. Soft-sided luggage sets are often made of fabric that yield and flex, usually woven nylon fabric such as ballistic nylon. Ballistic nylon is versatile and can take quite some abuse, but may abrade over time. The abrasions do not, however, compromise the fabric strength. Other materials such as Cordura are abrasion-resistant and a little softer; commonly used for making duffel bags, cosmetic cases, and carry-ons. Hard-sided luggage bags are nowadays made with high-tech plastics such as polycarbonate and ABS that are both durable and lightweight. Polycarbonate is more durable while ABS is the lightest. Aluminium is also another much more durable option, but it’s also the heaviest. Most Hard-sided bags often feature a split opening mechanism that allows you to pack on both sides and stabilise the contents with a strap. Good for securing breakable contents Firm edges can make it difficult to fit them in tight spaces such as in some cabins or under the seat. The best luggage sets come in different sizes and weights, and your choice will primarily depend on the length of your trip and the airline luggage restrictions. If your trips are lengthy, requiring additional clothing for different weather conditions or tools of trade, then you may want to consider buying large, heavy duty luggage. In this case, the weight of the luggage might not be a concern. On the other hand, an occasional traveller who makes short trips will appreciate small size and lightweight luggage sets. Your age will also dictate your luggage size and weight preferences. Older people may feel more comfortable with a lighter size while the younger travellers may compromise on weight as long as other preferences fall in place. The general rule for most travellers when buying the best luggage sets is to choose the smallest and lightest set that can comfortably accommodate and protect your personal items. Most luggage sets fall into two categories; two wheels or four wheels. Hard-shell luggage sets tend to have four wheels which make them easier to handle while soft shells commonly come with two wheels. Each has their own advantages and disadvantages. Until recently, most luggage designs had two wheels, but with the introduction of lightweight materials, most manufacturers are now shifting to the four-wheel system. Two-wheel suitcases are also referred to as rollers. They only roll forward and backward, but not sideways. The suitcase typically roles behind you as you pull on the extending handle. Four wheels are more common with larger hard-sided bags. They are known to be more stable when rolling across uneven surfaces. They typically have large diameter wheels with a wider distance in between them. Buying the best luggage sets should not be that complicated, in fact, it’s not that different from buying single piece bags. You basically have similar things in mind such as durability, quality, material, handles, wheeling system, brand, weight, style, size, and the price you are willing to pay. When purchasing the best travel luggage, we often have a mixture of future trips in mind. Your purchase will reflect your overall future travel plans. If you anticipate short trips, then perhaps range of carry-on bags and maybe one large piece. would suit best. Check here for a detailed review of carry on luggage. If however you anticipate long family holidays, then a combination of large and small luggage pieces would be more beneficial. Whether to choose soft-sided or hard-sided sets will depend on the type of items you intend to transport and your preferences. For heavy tools and items, the hard-sided set is logical, while the soft-sided set is great for garments and other lighter items. Many of our recommendations in our best luggage set review are available in different designs, styles and colours. Feel free to mix and match to suit your personality and travel style. To complement your travels you may also be interested in our guides for choosing the best travel accessories, best travel iron and best camera strap. Hi Alan, A great selection of bags. Our personal favorite is still samsonite, I bought a hard case bag in Melbourne a few years ago and have never looked back. They have great quality and design making them perfect for all travel types. Informative, only one issue. If this is an Australian based article, why are none of the brands able to be purchased domestically? Call me crazy, but paying something like $270 shipping for a $198 bag set seems like a bridge too far. I’m sure this was obvious when you wrote the article as well. Thanks for the comment Nathan, yes hear what your saying. We are currently working to rectify that and hope it will improve very soon.